Fall Sale Extravaganza Saturday, October 27th! Home/News/Fall Sale Extravaganza Saturday, October 27th! Fall Sale One Day Only! The Fall Sale Extravaganza is an event not to be missed! The date is Saturday, October 27th. The sale begins at 9:00 AM and the final bell will ring at 5:00 PM. Great savings on Oceanic and Aqua Lung Packages at prices that are incredible. An Aqua Lung regulator setup with BCD, regulator, octopus, and gauges for only $699.95! Dive computers from Atomic Aquatics, Oceanic, and Aqua Lung will be pared down for fantastic savings! Special discounts on our lines of awesome wetsuits! Close outs on discontinued items priced so low to be believed!!! But wait! There’s more!!! Toucan Dive’s Autumn Sale Extravaganza will be offering rental equipment at unbelievable prices! Discounted items will be marked throughout the store. Check out the diver t shirt lines that will be marked down for this exciting, and fun event. Now is the time to take advantage of this once a year event! 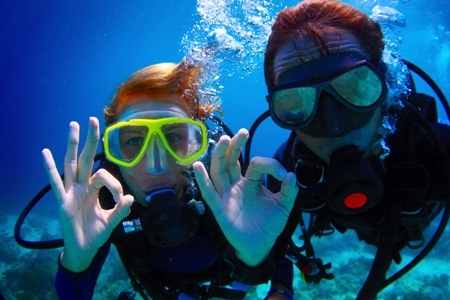 Get ready to go diving here in the Midwest, as well as all those awesome tropical dive destinations in the future! We will be going to Mermet Springs, Bonne Terre Mines, Statia, Fiji, and Egypt, this travel season. You will need to be ready with the right equipment! Why not save money as well! The Toucan Dive Fall Sale Extravaganza is not just shopping but rather an event. There will be free breakfast items and coffee for the early risers, as well as a hotdog barbecue and popcorn in the afternoon, as well as plenty of snacks! There will be hourly giveaways and raffles for some incredible swag! The grand prize for the event’s final drawing will be the Oceanic B.U.D. Dive Computer! So Toucan Dive is the place you want to hang on Saturday, October 27th. Don’t miss out! We’ll see you here!